If you’re reading this then I can safely assume that you are looking for, or considering a new cookware set or individual piece of cookware. Perhaps it’s for your own kitchen or for a very lucky friend as a gift. Well, there’s cookware…then there’s excellent cookware. The All-Clad Copper Core Cookware collection is definitely in the latter group. Make no mistake, this is a high-end, high price collection. In this review, we take a close look at the All-Clad Copper Core cookware collection so you can be sure it’s the right choice for you. We can tell you now, we are super impressed by the design features, construction, aesthetics, materials, versatility and overall performance of this range. As the name suggests the Copper Core Collection’s shining feature is the solid layer of copper running through the core of each piece, sandwiched between stainless steel and aluminum. But more on that later. Let’s get down to it! We’ll look at a comprehensive cookware set first, then get into individual cookware pieces, complete with pros and a final verdict to help you make your decision. 16.1 Why is copper a great material for cookware? 16.2 Should I put my All-Clad Copper Core cookware in the dishwasher? At first sight, this is an absolutely stunning cookware set. 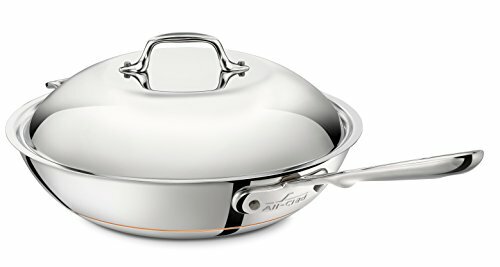 The shiny, silver stainless steel exterior has a thin, visible copper line running through (a sign of the solid copper core layer running through the piece), characteristic of all All-Clad Copper Core cookware items. Also crucial to the Copper Core collection is the 5-ply layered construction, in this order: stainless steel, aluminum, copper, aluminum, stainless steel. This layered construction is designed for fast and even heat responsiveness and warp-free durability. The lids are made from shiny, polished stainless steel, with a loop handle for easy lifting. The lids have ridges which sit tightly and firmly onto the curved edges of the pans. This is a great design feature as it holds the moisture, heat and flavor in. The handles are long, sleek, contoured and designed to remain cool when on the stove. They’ve also got holes on the ends so you can hang your cookware on a hook to display the shiny beauty on your kitchen walls. The stockpot, saute pan and 3-quart saucepan all have loop-shaped helper handles on the opposite sides to the main handles. These are very important for safely and securely moving heavy, hot, full pans from A to B, for example, from the stove to the oven. Each piece in this set is oven-safe up to 600 degrees Fahrenheit, and they are compatible for all stovetops, including induction. As far as a comprehensive cookware set goes, this one has everything you need for a couple or small family. You could definitely buy this set without having to worry about adding extra items unless there are specialized cookware pieces you need (perhaps the stir fry pan or chef’s pan further below?). A perfect set if you have a decent budget, an induction cooktop and you regularly use your oven with your stovetop cookware. If there were to be one thing which this set could benefit from it would be a non-stick pan for wet foods such as pancakes and eggs. But this can be easily bought and added to the collection if you find you need it. If there’s one thing you need in your kitchen (apart from a saucepan), it’s a durable frying pan. From breakfast (sauteed mushrooms and bacon), lunch (a spot of fish or chicken) and dinner (steak and veggies). If you’re lacking a great frying pan, you’ll certainly notice the inconvenience. This pan has the Copper Core 5-ply layering for extremely sturdy, warp-free, fast and even heat conductivity so you don’t need to fret about hot spots and your pan sitting unevenly on the heated surface. The sides are flared outward so you can flip your food easily and without a disastrous mess on your stove. The edges are also flared, so you can pour leftover liquids and sauces without that annoying dripping and spillage. The handle is long, contoured for comfort, and designed to stay cool enough to touch. Once you’ve finished searing your food, you can transfer the pan to the oven for broiling or to keep warm, as it is oven-safe up to 600 degrees Fahrenheit. While it is labeled as “dishwasher safe”, we recommend hand washing the Copper Core frying pan to keep the stainless steel from becoming tarnished. If you want a small-ish frying pan to last you forever, it doesn’t get much better than this. 5 layers including stainless steel, aluminum and copper ensures the surface of this pan won’t warp or become misshapen. 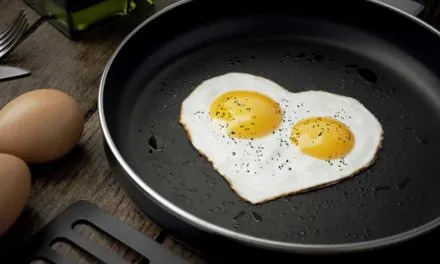 If you’re looking for something for cooking eggs and pancakes, I would go for a non-stick option simply because stainless steel can be a little tricky with such wet and sticky foods. This frying pan is ideal for meats and veggies, especially dishes which require oven cooking as well as stovetop cooking. If you’ve got an induction cooktop, even better! Every home kitchen needs a stockpot, especially during Winter. Soups, stocks, chili, large stew portions and laksas all require a large enough pot to accommodate all of the ingredients without spilling or spitting when stirring and bubbling. The All-Clad Copper Core stockpot provides the practicality required of a stockpot but it also offers shiny, pretty silver aesthetics which would look amazing in a permanent home on your stovetop. The lid sits snug and tight onto the pot to keep moisture, flavor and steam in the pot as your soup or stock simmers and bubbles. 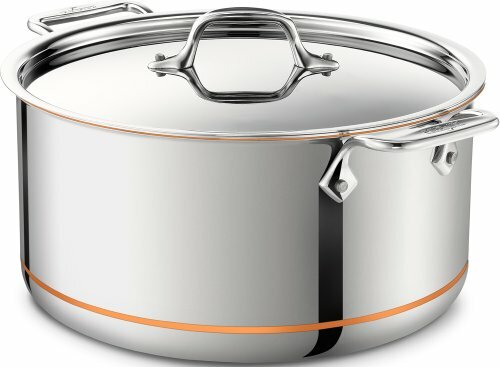 You can pop this pot onto the stove (induction included) to start the cooking process, then transfer it to the oven (with the lid on) up to 600 degrees Fahrenheit to braise or slow cook. Perfectly adapted to the cooking on induction hob. Make use of your leftover chicken bones or Winter veggie harvest and make your own stocks to stash away in the freezer for soups and curries. If you’ve got a decent budget set aside for a stockpot, definitely consider this one seriously. The 5 layers of high-quality metal, (including copper) makes this a lifetime piece you’ll use without risk of warping or wearing over time. You only need one stockpot (generally) so make it a fantastic one that lasts. This is more than a frying pan, it’s more like a wok with a flat bottom, like a wok/frying pan hybrid. The tall, sloping, curved sides and small, flat bottom conduct heat in an ideal way for a perfect stir fry. The flat surface holds most of the heat so you can cook meats thoroughly, but the sides stay a little cooler so you can add veggies and toss them without overcooking. The long handle with curved, cool-touch construction makes tossing and shimmying food around the pan easy. The looped helper handle allows you to pick the entire pan up with both hands if you need to give it an extra vigorous toss. For anyone who regularly cooks stir-fried veggies, meats and noodles, a wok-style frying pan is crucial. It’s important to choose a pan which can withstand high heat, won’t scratch when used with a metal utensil, and has sturdy handles for an easy grip. The All-Clad Copper Core Stir Fry Pan ticks all of these boxes. Plus, it’s incredibly attractive and would look amazing in any kitchen. A chef’s pan is a wonderful tool for making risottos, stir-fries and other dishes where both stirring and moisture evaporation are important. The large, flat cooking surface allows for sauteing and browning of veggies and meats, while the tall, sloped sides and “wide mouth” allows moisture to evaporate faster and easier. There’s enough cooking surface and depth to add liquid and stir slowly (i.e. risottos and curries). The tall, round, domed lid allows you to lock heat and moisture into the pan. This is great for steaming veggies and keeping food hot and protected until and between servings. This is a super sophisticated piece of cookware made from 5 layers of high-quality metal (crucial copper included). If you’re finding that your regular frying pan just isn’t meeting all of your cooking needs, this could be the missing link. It’s not necessarily a staple piece for a starter set, but it’s definitely useful for prolific home cooks. This is a unique item on this list: a double boiler with a porcelain insert. 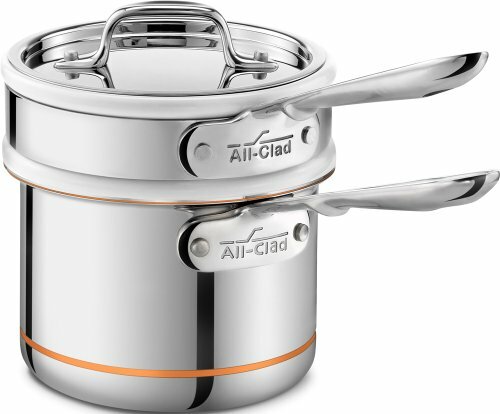 You get a 2-quart saucepan (complete with Copper Core 5-ply construction), and a 1.5-quart porcelain insert which fits inside the saucepan. You also get a lid to trap moisture and heat into the double boiler, and the saucepan if using separately. 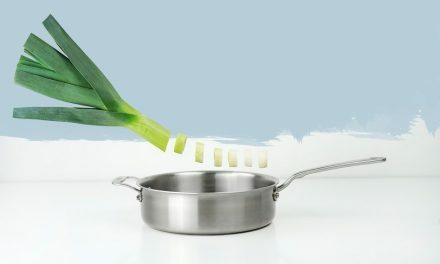 By adding water to the saucepan and placing the porcelain double boiler over the top, heat is applied indirectly to the food inside so it can heat and cook slowly and gently. This is perfect for melting chocolate (which burns easily) and making curds and custards which can curdle, split and burn when placed over direct heat. For a regular home baker, this could be a very handy little addition to the kitchen. You can use the saucepan separately as a normal saucepan, so it’s not solely intended for double boiler usage. All of those All-Clad Copper Core features are present: 5-ply layering, long handle, high-shine finish and curved edges. Yes, this pan does have a very hefty price tag, but once you consider how many uses it serves, the price seems to become all the more understandable. The All-Clad Essential Pan has a 4-quart capacity, reasonably high sides and a large cooking surface. It has a lid, a long handle and a helper handle too. You can use this pan for everything from searing meats, sauteing veggies, simmering sauces, stirring risottos and slow braising meats in the oven. It’s the kind of cookware piece you’ll find yourself using day after day. Thanks to the 5-ply stainless steel, aluminum and copper construction, this pan won’t falter even after decades of use. Multi-layer material with a copper core. Extremely high efficiency thanks to the milled, thick core made from pure copper. Unrivalled heat distribution for consistent and professional cooking results. Suitable for cooking on induction hobs. Five layered structure: Ferromagnetic stainless steel – aluminium – copper core – aluminium – ferromagnetic stainless steel. Once you’ve covered your saucepan, frying pan and stockpot bases, we think this has to be the next on the list for your cookware collection. It combines size, shape, design features and durability to create one incredibly versatile pan you’ll use all the time. It’s oven safe up to 600 degrees Fahrenheit so you could even use it as a roasting dish in a pinch. The tight-fitting lid locks heat and moisture in when simmering on the stove, and helps to stop food from drying out when in the oven. The All-Clad Copper Core Collection is one of the best cookware sets money can buy. The high price reflects the high-quality construction, materials and design features. We think that the 10-piece cookware set is a worthy set to put on your shortlist if you’re looking for a high-quality, high-price cookware set to last. The 5-ply construction is what makes this collection ever so durable and user-friendly. The aluminum helps with even heat distribution, the copper really speeds up the heat conductivity, and the stainless steel provides scratch-free, stain-free surfaces with shine, style and non-leaching safety. For specific pieces intended for multiple uses and a lifetime of durable usage, the Copper Core range has some real winners. The Essential Pan, Chef’s Pan and Stir Fry Pan are all highly functional and will carry you through a lifetime of cooking on both the stove and in the oven. If you love the look and overall practicality of the All-Clad Copper Core range but you just can’t swing the cost, you could look at the All-Clad MC2 range which is a little more cost effective but still high-quality, durable, attractive and highly functional. Remember that the All-Clad Copper Core Cookware collection is induction compatible and every item comes with a limited lifetime warranty. Why is copper a great material for cookware? Copper has been used as a home and cookware material for thousands of years (yes, thousands). 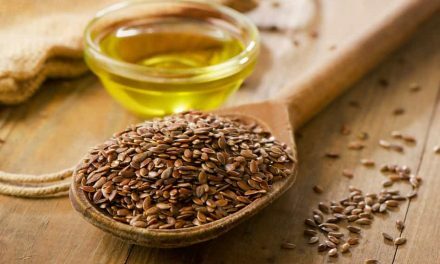 Although there are issues surrounding copper coming directly into contact with food, (it can be toxic), it is the perfect material for sandwiching between other metals. Copper is a fantastic heat conductor, one of the very best. Stainless steel, on the other hand, is not so great at conducting heat, but it is a safe cooking surface with a durable nature. When we layer stainless steel and copper together, we get amazing heat conductivity (thanks, copper) and a safe surface (cheers, stainless steel). 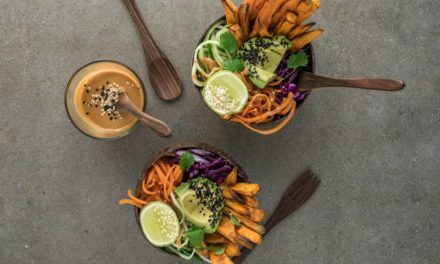 Cookware brands such as All-Clad have harnessed the heat-loving power of copper while still maintaining a safe, non-toxic cookware. Should I put my All-Clad Copper Core cookware in the dishwasher? 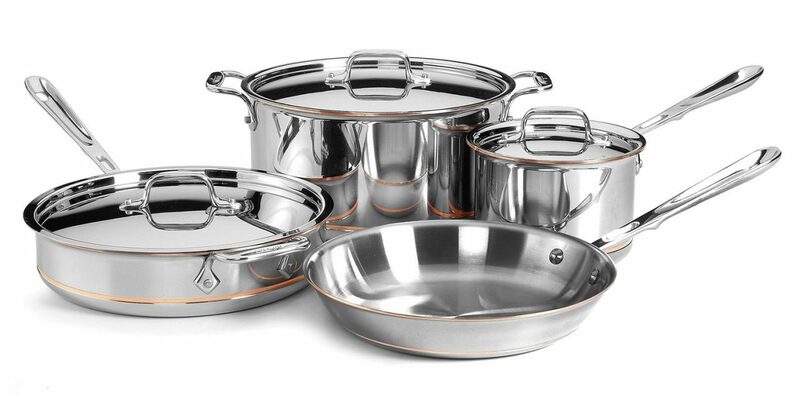 You will see that the All-Clad Copper Cookware collection is labeled as “dishwasher safe”. While this is the case, we think that it’s best to hand wash your Copper Core cookware when you can. Hand washing your Copper Core cookware will help to preserve that gorgeous high-shine lustre of the stainless steel. Gentle hand washing can help to prevent water spots and staining as well. While your cookware will probably be completely fine after a few dishwasher rounds, try to make it a rule that you hand wash your Copper Core cookware unless you’re too exhausted or there’s just no time to hand wash and dry.